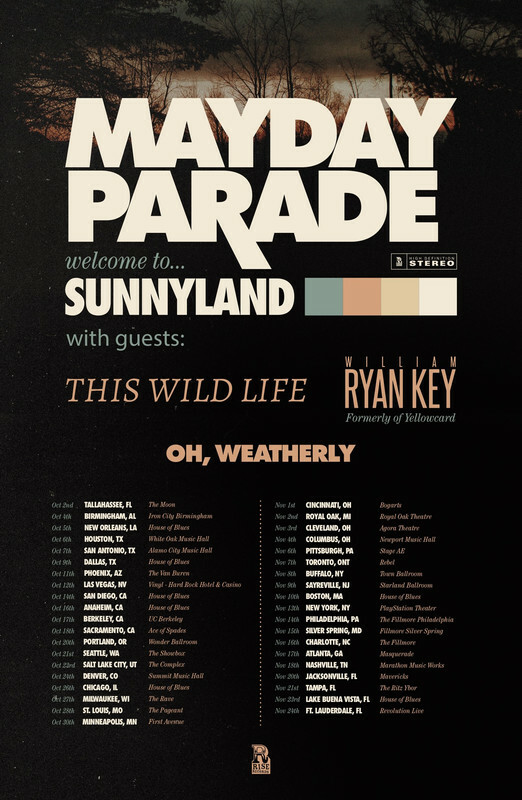 Mayday Parade has announced the Welcome To Sunnyland Tour, the first North American headlining run in support of the recently released LP Sunnyland, out now via Rise Records. Kicking off with a hometown show in Tallahassee, FL on October 2nd, the tour will feature support from This Wild Life, William Ryan Key (formerly of Yellowcard), and Oh, Weatherly. VIP packages are on sale beginning tomorrow, August 8th at 10AM local time with general on sale beginning Friday, August 10th at 10AM local time via http://maydayparade.com/tour.